The ZyXEL GS-4012F is an intelligent Layer-3 Gigabit Ethernet switch specially designed for service providers to deliver profitable Ethernet services. With high-performance switching functionalities suitable for triple-play services such as Internet data exchange, Web surfing, IPTV and VoIP telephony, the GS-4012F enables service providers to deploy integrated and value-added IP services. The GS-4012F is a low port density solution for service providers; with 8 open SFP slots and 4 Gigabit Ethernet dual-personality ports, the GS-4012F can easily fit into any fiber-intensive deployment scenarios. 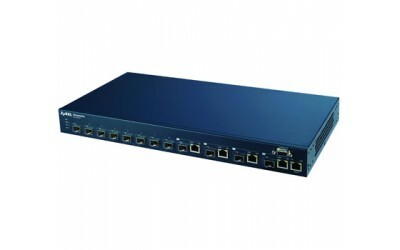 The GS-4012F is designed for the market of large Internet service providers and Telcos. With carrier-class 16K MAC Entries/8K Routing Path, the GS-4012F can be easily deployed in a huge metropolitan network to fulfill future expansion of subscriber numbers. 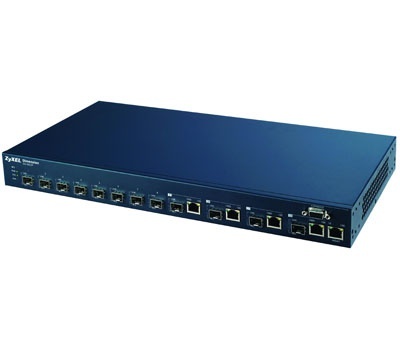 The GS-4012F delivers wire-speed full-dynamic IP routing features, such as OSPF and RIP, using a hardware-based IP routing engine and sophisticated multilayer operating software. In addition to dynamic IP multicast, the GS-4012F supports Distance Vector Multicast Routing Protocol (DVMRP) and Internet Group Management Protocol (IGMP) to perfectly handle a variety of datagram, making the ZyXEL GS-4012F an ideal solution for today's multi-service network environments. The GS-4012F works with the intelligent 3-tier security mechanism that offers complete data protection on the data and management plane via a wide range of security features to protect subscribers' data and administrative traffic to deter unauthorized users. The 802.1x authentication and port security features provide the ability to deny unauthorized users from accessing the network, while Limited MAC number by port limits the total number of devices connected to a switch port, and thus significantly reduces the risk of unknown access from massively deployed wireless networks or hubs. Cooperating with RADIUS, 802.1x is useful in preventing unauthorized access with username and password (or other credentials) and it acts as powerful access control for convergent networks with mixed wired and wireless access. The multilayer (L2/L3/L4) ACLs suite of GS-4012F has sophisticated rule-based control mechanisms that can be easily deployed based on realistic network environments via a Web GUI or command line interface to prevent illegitimate access. The rules can be defined to deny packets according to source and destination MAC addresses IP addresses or TCP/UDP ports. The ZyXEL GS-4012F offers wire-speed flow control that can classify, policy, and prioritize incoming packets according to the predefined QoS policies to meet service provider requirements. In terms of classification, Differentiated Services Code Point field (DSCP) and the 802.1p class of service (CoS) fields are identified to assess the priority of incoming packets. Classification and reclassification can be based on criteria as specific as rule-based on IP, MAC addresses, VLAN ID and TCP/UDP port number. For bandwidth management, the ZyXEL GS-4012F provides 8 priority queues per port for different types of traffics, allowing service providers to set rule-based rate limiting that takes full advantage of limited network resources and guarantees the best performance. A round-the-clock network capable of quick recovery is vital for service providers to establish robust services. The ZyXEL GS-4012F provides comprehensive features to ensure the network is fully operational. The IEEE802.3ad link aggregation feature reduces network downtime by providing redundant paths and bandwidth aggregation to critical connections, while IEEE802.1w Rapid Spanning Tree Protocol (RSTP) and IEEE802.1s Multiple Spanning Tree Protocol (MSTP) allow immediate recovery from failed links by sending packets via the backup path. Furthermore, since the GS-4012F supports backup power system, power can be delivered to the switch in case of unexpected power outages.